TWO independent wargames: the naval battles and the land battles of Russo-Japanese War; each game is independent and historically detailed. Play them separately, or join them for a grand resolution of the Russo-Japanese War! 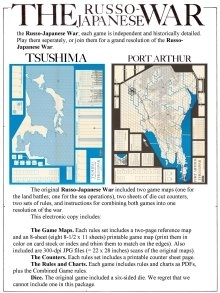 The original Russo-Japanese War board war game from Game Designers' Workshop included two game maps (Port Arthur for land battles; Tsushima for the sea operations), two sheets of die cut counters, sets of rules, and instructions for combining both games into one resolution of the war. The Game Maps. Each rules set includes a two-page reference map and an 8-sheet (eight 8-1/2 x 11 sheets) printable game map (print them on card stock or index and trim them to match on the edges). Also included are 300-dpi JPG files (= 22 x 28 inches) scans of the original maps). The Counters. Each rules set includes a scan of the original counter sheet and a printable counter sheet page. The Rules and Charts. Each game includes rules and charts as PDFs, plus the Combined Game rules, and the Consolidated Errata. Dice. The original game included a six-sided die. We regret that we cannot include one in this package.